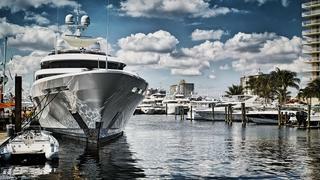 The 2017 Fort Lauderdale International Boat Show will be the first yachting event in the US to benefit from a new foreign trade zone that has been introduced to boost business in this popular boating hub. Approved in April and activated earlier this month, the foreign trade zone allows foreign-made yachts to be exhibited at the show without paying 1.5% import duty. The largest on-water boat show in the world, the Fort Lauderdale International Boat Show regularly attracts in excess of 100,000 visitors as well as European exhibitors such as Benetti, Feadship and Sanlorenzo. The news of the foreign trade zone designation comes shortly after Bahia Mar extended the show’s lease until 2050, putting to bed rumours of an uncertain future. Andrew Doole, vice-president and general manager of FLIBS organiser Show Management, hailed the benefits of the new trade zone, saying: "This new designation, spearheaded by the Marine Industries Association of South Florida, should attract more boating business for builders, brokers and many others working within South Florida’s yachting business community. As the saying goes, a rising tide lifts all boats." Hosted each November for the past 57 years, the Fort Lauderdale show is a key part of the Florida yachting calendar and yachts due to attend this year include the Viking 93 Motor Yacht and the 47 metre Heesen yacht Book Ends.